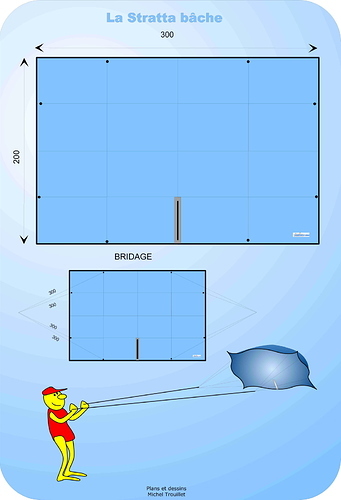 What kite plans do you like? Why? Do you have a link to the drawings and instructions? All kite types welcome. Links to related info welcome. Any use possibility as AWES? I am not sure this is related to the present topic. As such or with few modifications it could be an Isotropic kite . I like also the playsail for its simplicity: only a rectangle (a tarp with eyelets for example) with a tether in each corner. See also The most basic airborne wind energy system . http://2e5.com/kite/npwc/falken/ : " To appreciate how big a leap this was, consider that the state of the art briddleless single skin design at the time was something called a playsail, an ‘almost kite’ that has more drag than lift and can only be flown with a wide separation of lines." The playsail is not as efficient as the single skin kite mentioned by Tallak, as the elevation angle is lower. The Nasa Para Wing (NPW) kites are extremely popular and it’s not hard to understand why. First of all, they are cheap to buy and offer a cost-effective way into many power kite sports. Second, you can easily build one yourself and there are many plans available on the internet. Third, they pack down small and weigh very little so it’s easy to always have one with you. Fourth, the time required for setting up to fly is minimal – a minute or two is enough! Fifth, they are easy to launch, land and relaunch without assistance, regardless of size. Sixth, they have a massive pull relative to their size. Seventh, they are virtually unbreakable (but please remember that you are not!). Eighth, because of their excellent low wind properties, they have a wide wind range." A lot of interesting plans are on http://2e5.com/kite/npwc/falken/ and often come from Nasa Para Wing. They are cheap and sometimes efficient single skin power kites. A paper about a wing with multiple winglets is available on http://www.star-tech-inc.com/papers/aiaa/aiaa.pdf. A viable AWES using Stratta-Bâche-Kite? Tarp-Kite, Tarp-AWES?